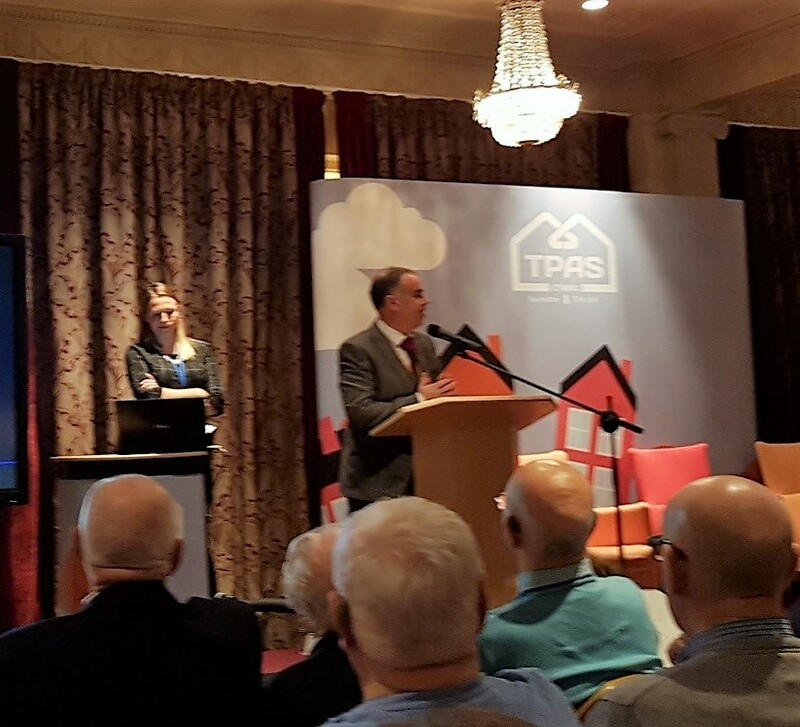 I was very fortunate to attend this year’s TPAS Cymru conference in Llandridnod Wells on behalf of Supporting Communities. ‘Doing things differently’ was the theme and the event looked at ways we can change preconceptions around tenant participation, for both tenants and staff members. The comfortable, relaxed atmosphere of the conference provided ample opportunities for information sharing and communication among delegates. Having made the trip from Belfast the night before with TPAS England Training Manager, Val Alker, I was enthusiastic heading into the venue. Val was kind enough to act as my personal chaperone introducing me to TPAS Cymru Director David Wilton and Assistant Director David Lloyd on the first morning just before they addressed the conference. The opening session set the scene with inspirational stories of personal experience. Samantha Shaw from Taff Housing Associations’ Resident Association gave a powerful talk about her own journey from abusive relationships and rent arrears, to joining a residents committee, participating on scrutiny panels, founding groups and attending training. She’s now on Radio Cardiff 3 times a week if you’d like to keep up with her! Up next was Luke Takeuchi from Rhondda Housing Association discussing a new performance management system his organization is using called Neighbour Hub. It analyses data from all their stock and distributes it monthly to the whole organization allowing for greater transparency, better action plans, and an improved monitoring system for certain areas. Rounding off the first session was Ken Perry, Director of Do-Well (UK) Ltd who explained that due to his own personal experiences, he was working to decrease the gap in health inequalities in Wales. “Where you live impacts on your health,” he told us, and the fact that certain people are still disadvantaged due to their geographical location is completely unacceptable and avoidable. I was interested to attend Ross William’s workshop to discover exactly what ‘Asset Based Community Development’ actually is and how his organisation is using it in the communities that they serve. Ross explained how Coastal Housing has adopted a restorative practice model that asserts problems within a community should be solved by the community. “If you take my problems away, that’s stealing!”, he joked. Ross went on to talk about challenges and barriers to this theory and the need for ‘buy-in’ from the community itself to fundamentally and realistically develop self-sufficiency. An excellent example of this was given by a member of the audience (completely unscripted, I’ve been assured), who explained that when members of their tenant association requested a DIY or handyman service, one member came forward and offered their services as they came from a building profession. This group now have regular meetings and communicate with the handyman to arrange any small work to be done in the area. The second workshop I attended centred around the benefits of arts and crafts when involving tenants or service users. Phoenix Averies from St. Giles Trust explained that crafts appeal to a wide audience and is the most inclusive and cost-effective method to engage ‘hard to reach’ people. Throughout the session, all the delegates had colouring pens and stencils doodle and design their own masterpiece. Of course, the quality did not matter, but, as Phoenix described, the fact that we had something to pre-occupy us during her workshop made us all more relaxed and encouraged better concentration. A few notable projects she mentioned included “The Creative Prison” project where prisoners worked with Will Alsop Architects to redesign a prison from the ground up, involving the inmates from the very beginning. Another was the art exhibitions run by the Koeshler Trust, where prisoners’ works are showcased in museums and galleries each year, building their confidence and self-worth. Sadly, I’m sure my own ‘work of art’ would not make it to an exhibition, but did make its way back to Northern Ireland! 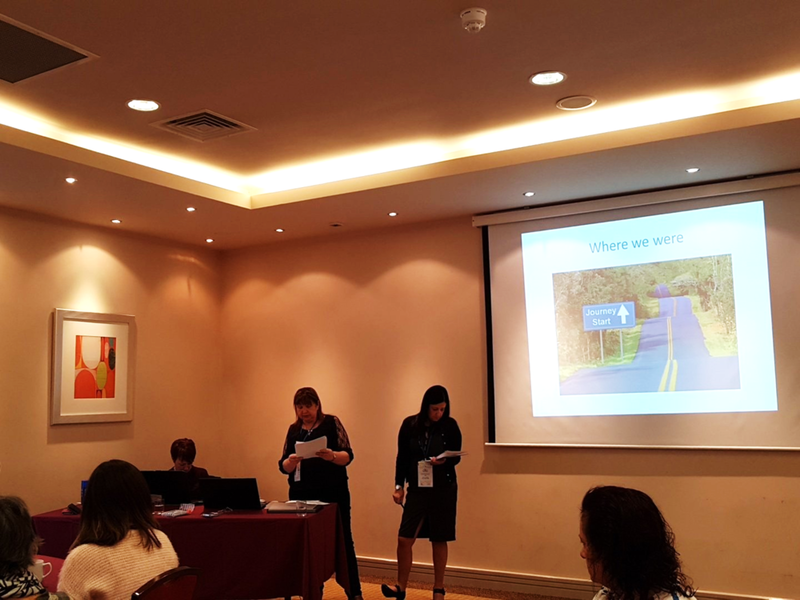 On the second day of the conference, I heard the story of how Caerphilly Council developed their tenant participation practice. Two representatives (Anna, a staff member and Sandra, a member of Caerphilly Council tenant’s groups) described core aim of the organisation summed up by the catchphrase “doing different things, and doing things differently”. Anna described her dogged persistence as a community activist in campaigning for a greater tenant voice (in some cases camping outside the office doors until she was heard). As a result of her unrelenting pressure and desire to make a change, she set up a tenants group (Caerphilly Homes Task Group) and from there a number of other groups were established. Anna then became a staff member with Caerphilly Homes and now, as part of their tenant participation strategy, tenants are involved to a degree only dreamed about before. They are part of, and have influence over, the Service Improvements Monitoring Group making changes in the way things are done, for example, instead of satisfaction surveys being posted, tenants on the task group will contact other tenants and ask how satisfied they were with the service. An emphasis has been placed on involving tenants at all levels (including strategic) and partnership working. I thought it was a very useful insight into how things are done in Caerphilly! The final workshop I attended was a case study from Gwalia Housing association (part of Pobl Group) on how they went about planning and creating a co-operative housing development in Carmarthen which involved prospective tenants in all aspects of the building process. Their project ensured that everyone who was being allocated a property in the development was willing and keen to actively manage the tenancies and activities within the area. Beginning in September 2014, the founding members (prospective tenants) were part of the co-operative liaising with contractors and housing staff members along the way to ensure the delivery of outcomes that suited them. They helped chose the specification and colour schemes of the properties, as well as how they would manage maintenance and repairs. In January 2017, 27 families moved into their brand-new homes and are developing a thriving sense of community there. The development is called Old Oak Housing Co-Operative, Carmarthen and the tenants even designed a logo for the development which can be found on their website. At the end of the day in his final remarks, David Wilton reiterated the importance of attending these events not just for networking, but for information sharing and learning from others within the sector. The changing nature of participation was evident throughout the conference: the theme ‘Doing things differently’ was encapsulated in each workshop and provided practical lessons for professionals and tenants alike. My own takeaway thoughts were to always be mindful that different customers or service users prefer different types of interactions and communications. Digital correspondence and exchanges are becoming more and more accessible so providing that option in our training would be very beneficial, while also ensuring that my face to face provisions are as efficient and as bespoke to the customer as they can be.